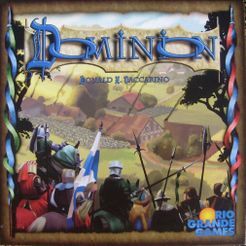 Dominion PriceCompare, Buy this board game at the Lowest Price. In Dominion you're trying to increase the size of your Estate by adding villages, markets and such until it becomes a…wait for it… DOMINION. In actuality you're acquiring victory points (hopefully more than your opponents). I have to admit, I wasn't thrilled about the idea of Dominion. It was sold to me as "It's like Magic: The Gathering except you don't have to buy booster packs". Turns out that definitely sells the game short. While the game does revolve around building a deck of cards over time it's the initial simplicity, the developing depth, and the unique way it provides endless replayability that makes it a game worth playing. Let's take a look at how the whole thing works. My earlier quote is vaguely correct in comparing Dominion to Magic: The Gathering. Both are card games that involve building a deck. The main difference is that instead of buying booster pack upon booster pack to build that perfect deck, Dominion comes with all the cards you'll need, and you'll build your deck while playing the game. It sounds a bit confusing but it's actually quite simple, and takes about 5 minutes to learn and you're off and running. You start the game with 10 lowly cards, 3 Estate cards worth 1 victory point each, and 7 Copper cards worth 1 buying point each. Shuffle these up and draw 5 and that's your hand for the first round. Laid on the table before you are treasure cards (Copper 1, Silver 3, Gold 6), Victory cards (Estates 1, Duchy 3, Province 6) and 10 Kingdom cards which you'll eventually play to gain bonus cards, money, or to attack your opponents. Each turn has 3 phases and can be remembered as "A-B-C", Action-Buy-Cleanup. So say your starting hand has 2 estate cards and 3 copper cards. Now the estate cards will add 1 victory point at the end of the game but are essentially useless now. You have no action cards yet so you move right into the buy phase. So on your first turn you can spend 3 copper and buy a card on the table. You can't use it this turn so your 5 original cards plus your new one go into a discard pile that you keep, and you draw 5 more cards to end your turn. When you run out of cards in your deck you shuffle the discards thus putting your bought cards into you hands, where you can then play them. Afterward again all cards go into the discard pile to be reshuffled. Rinse and repeat. This process repeats itself over and over to play action cards to gain bonuses, buy cards on the table, and discard everything. As the deck gets used over and over it becomes more powerful as you add to it. The game ends when 3 stacks of the 10 kingdom cards are depleted or all of the expensive victory cards have been bought. When this happens people count up the victory points in their hand and whoever has the most is the winner! It moves fast and with people that know how to play takes about 30 minutes to play from beginning to end. What makes the game incredibly dynamic is that it comes with 25 different kingdom cards, though you only use 10 in any given game. This allows for all kinds of combination and randomization so no two games play out the same way. It's not often a game of this length offers such a variety, and when you throw in the all the decks from the optional expansion sets you get hundreds of thousands of possible combinations of those kingdom cards to play with. I'll admit at first Dominion did not garner any of my attention. At a glance it just seemed like something I wouldn't like. But as I was researching new board games online this one kept popping up on bestseller and "best of the year" lists. I decided I should take a second look — obviously there was something in Dominion that I wasn't seeing. I think what keeps bringing people back (including me) is the simplicity and speed of the game coupled with the immense variety of cards. The deck building mechanic is something truly unique (at least in my travels), as everyone starts out with such a weak deck and towards the end you have all kinds of options for what you can do if you've done a good job building it up. And since the game plays so fast, you can play it a few times in a sitting to work out the correct strategies. The random kingdom cards always seem to throw a monkey wrench into your plans, which does a great job keeping you on your toes. While your supposed to be buying property and treasure to expand your Dominion, there's not really any need for it to be themed in medieval times. This game could've just as easily been in space where you're buying space ports instead of provinces (mark my words this will probably happen). So if you're not the medieval fan it's not necessarily going to turn you off to what's going on. I'd recommend this game to just about anyone that enjoys playing card games. It's super easy to learn thanks to the well done manual, and just as easy to teach. This has become an important consideration to me because as much as I enjoy some uber-complicated games, and it's hard to find people willing to learn how to play them. It's the downside of playing analog games, it makes you appreciate how something like Xbox Live can almost without fail find you an opponent for whatever game you're playing. So far we've looked at Ticket to Ride, Hive, and now Dominion. I can honestly say they're all very different games, but they're each fantastic in their own way. We're slowly building a hell of a game collection. If you're looking for a game to try out, I can't recommend Dominion enough.